L’Eglise, les catholiques français et le nucléaire civil. 20 juin 2014 : Un article sur le site Ecowatch évoque des fuites de citernes de fuel dues à des inondations locales. On June 20, Colorado’s Cache La Poudre River—a National Heritage Area, and home to Colorado’s only naturally self-sustaining wild trout population—was contaminated by more than 7,500 gallons of crude oil, hazardous liquid waste, produced water and other fracking industry chemicals after a well-pad was engulfed by floodwaters from unusually heavy snowmelt. Though more than 100 feet away from the river’s normal course, excessive runoff wiped out a protective berm at the Noble Energy well site State 7-36, damaged crude oil tanks and broke key valves on what industry terms a “produced water tank” causing the chemicals to drain into the river. While the crude oil and other liquid wastes were releasing, the oil tanks began to float—quickly becoming lifted by the buoyant liquids accumulating under the tanks and unhinging them from their moorings. The tanks then spilled even more crude oil and other toxins into the river. The state mandated anchors fastened to the tanks to prevent them from moving or spilling completely failed. Worse, because of inadequate oversight, it is unknown how long State 7-36 was draining into the Poudre before inspectors became aware of the situation. Adding insult to injury, though the well was previously operated by Kerr McGee and then sold to Noble Energy, the actual mineral rights that this particular well was accessing belong to the State of Colorado. Another question that remains is how much revenue the state lost as the hydrocarbons owned by tax payers washed downstream—let alone how much additional costs will be born by those citizens because of the state’s decision to frack so close to the Poudre River in the first place. Upon review by the oil and gas analyst and advocacy group, Fractivist.org, official form-19 “spill incident report” documents obtained from the Colorado Oil and Gas Conservation Commission (COGCC) indicate that State 7-36 was inspected just after the surprise “tropical rainstorm” in September 2013 that poured historic volumes of water onto Colorado’s already unusually soaked mountains. Though wells all around it were heavily impacted by last year’s floods, 7-36 was not only listed as “undamaged,” but state documents show it wasn’t even a part of the last year’s flood impact list.Despite recent inspection, the late spring surge of unexpectedly large flood waters, caught the regulators flatfooted. Not only were they unprepared to deal with the situation, they couldn’t even access the site for nearly a month after Noble reportedly “shut in” the well. It’s likely the public will never know how much crude and other toxins spilled into the river since Colorado’s already challenged inspection regime—less than 20 inspectors for more than 52,000 active wells—can not evaluate the full impacts of the spill. Dually mandated to both regulate and promote the industry, COGCC inspection reports reveal that more than 65 percent of Colorado’s wells and production facilities—in excess of 34,000—escaped inspection in 2013. The headwater streams that constitute the sacred Cache La Poudre begin deep in the Front Range mountains in western Larimer County and the northern part of Rocky Mountain National Park. The river descends eastward carving a spectacular canyon through the Roosevelt National Forest emerging from the foothills north of the city of Fort Collins. East of the city, which voted to place a five year moratoria on fracking and other oil and gas production last fall—more than 500 fracked oil and gas industry wells line the river’s banks as it meets the South Platte near Greeley. The Platte itself is also lined with dozens of other wells, well-pads and other oil industry equipment. Last year’s floods sent water and debris crashing into 1,963 wells along these river corridors, overwhelming their integrity and resulting in more than 85,000 gallons of liquid industrial waste spewing into the swollen rivers.The Poudre River is the only river in Colorado that boasts a naturally self-sustaining wild trout population. It is listed as a National Heritage Area—including the 100-year flood plain of the river from its emergence out of the mountains to its confluence with the South Platte River—but is now pockmarked with wells. Though all the recent spills occurred downstream, many water experts believe that even upstream impacts can be felt by various micro and macro-invertebrates, that the oil and gas associated chemicals can impact river fowl, and affect the river’s own conductivity, thus impacting mayfly populations and other insect populations vital to a healthy river ecosystem. On May 24, 2014, in anticipation of potential flooding due to heavy precipitation and snowmelt, Noble Energy shut in oil and gas wells State M36-3, M36-5, 6-36, 7-36 and 8-36. Flooding and field conditions impeded safe access to the wells until June 20, 2014. 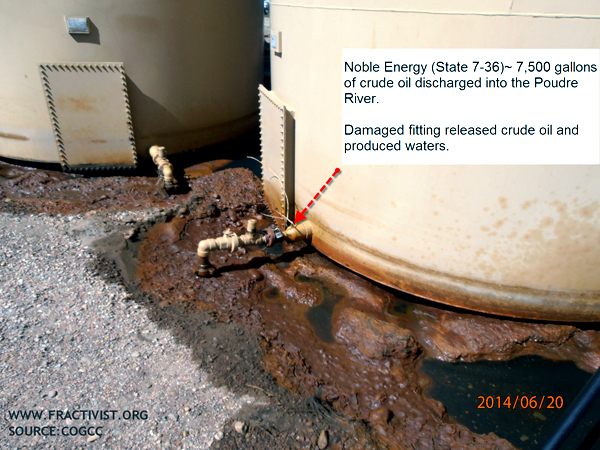 Immediately upon access to the tank battery unit associated with the above mentioned oil and gas wells, evidence of an unintentional release resulting from flood-related impacts was observed. Available information indicates a loss of 173 barrels of condensate. The cause of the unintentional release is believed to be a break in the produced water valve on the back of the condensate storage tank. Noble called a vacuum truck to the location to vacuum up pooling water as well as any remaining fluids in both the affected and non-affected storage tank. A third party environmental emergency response consultant was called immediately following the discovery of the unintentional release to assess the location and deploy clean up measures. Fractivist.org analyst Shane Davis explains that the COGCC knew that swift moving snowmelt runoff was on its way downstream, increasing the size of the flood plain and placing hundreds of the fracking industry wellpads along the river in immediate danger from being impacted by large volumes of fast moving water.“In preparation of flooding, the industry claims to have closed or ‘shut in’ the wells in the immediate flood path to control fluid loss from the wellbores themselves,” said Davis. ”But even though the wells were not producing at the time, all the unprepared industry could do was hope that crude oil and other industrial wastes stored onsite would not be released. We can see the results of their assumptions: almost 8,000 gallons of fish and fowl killing chemicals dumped into the river.” “The health, safety and welfare of Colorado’s rivers and communities throughout the state are in peril due to inadequate state regulations and a failing regulatory regime that simply is not up to the task of preventing a multitude of environmental hazards from happening because of our rush to drill and frack as quickly as possible.” Photo credit: Lee Buchsbaum. Note too, that chemical waste flows into the Platte through some of the most highly productive farmland in the nation. It is also the source of drinking water for much of the beef stock grown in Weld County, northeastern Colorado and throughout Nebraska. “It’s an open question as to if municipal water facilities are truly capable of detoxifying that water,” said Davis. Cet espace éditorial tente de suivre l’actualité des Eglises chrétiennes en lien avec les thématiques de l’écologie. Il constitue aussi, peu à peu, un lieu ressources pour les textes et déclarations dans ce domaine des décennies passées. L’auteur de ce blog (Dominique Lang), prêtre assomptionniste, est scientifique de formation et journaliste (à La Croix et actuellement au Pèlerin). Il a participé au lancement de la revue « Les Cahiers de Saint Lambert ».